filed under Marketing and Public Relations. 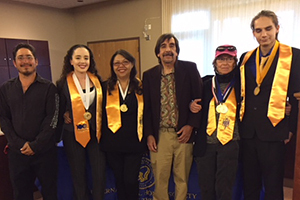 The spring induction ceremony for the Alpha Kappa Xi chapter of the two-year college international Phi Theta Kappa honor society took place recently in the Board Room. Interim President Cecilia Cervantes attended, and Nan Keegan, of Student Accessibility Services was the speaker. Ms. Keegan spoke about going back to school in her early 40s and becoming a member of Phi Theta Kappa at that time. Dr. Andrew Lovato, faculty adviser, and Dr. Jane Abbott, staff adviser, were also present. To join the Alpha Kappa Xi chapter, students must have a 3.4 GPA and have earned at least 12 credit hours toward a two-year degree. The average GPA of Phi Theta Kappa students is 3.8, and students contribute to the four hallmarks of Phi Theta Kappa in scholarship, leadership, service, and fellowship. Meetings are at 5:00 p.m. on Wednesday evenings in the Campus Center through graduation in May. Students will also be working on Hallmark Essays doing research and writing during the summer. Meeting times will be announced.